MICRO KITS 03 by EVAC, features 5 meticulously crafted drum kits, perfectly suited for use in anything from techno to hip hop. The collection of kits is made up of clean and tight drum sounds, brought to you by renowned sound designer and music producer, EVAC. The sample pack’s kits are formatted for a wide variety of samplers, providing instant inspiration within nearly any type of production environment. Additionally, MK03 features a custom Reaktor map and presets for Twisted Tools S-LAYER. By harnessing the power of S-LAYER’S advanced randomization and sample layering engine, the possibilities for generating new content are literally endless. MK03 comes with 30 kit and generator presets to get you started for S-LAYER. 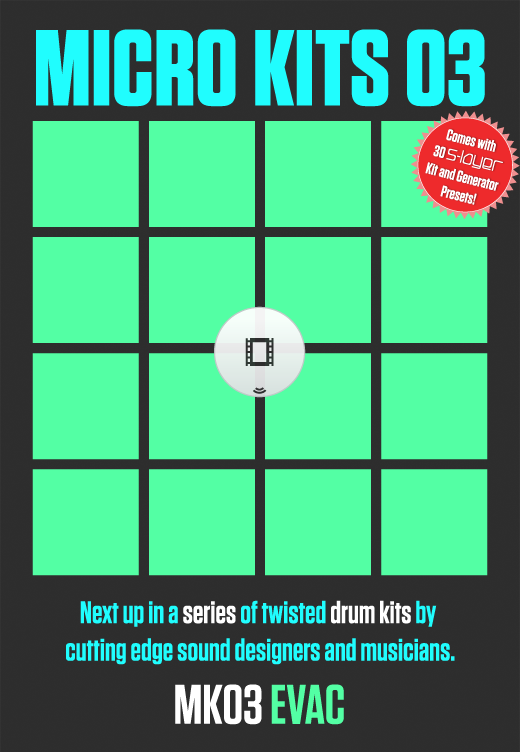 5 Drum Kits with 16 sounds each, designed by EVAC. Over the past 15 years Jeremy Goldstein (EVAC) has been immersed in nearly every corner of the audio industry. As a music house & production facility, his own imprint, Quadrant 5 Studios, has gained international recognition for it's scoring & sound design work for clients including Adidas, Diesel, Motorola, GM, & Time Warner. It's contributions to sound design have seen sample library development & patch design for companies Sony, Mutekki Media, Haptic Audio, A Hiss & A Roar, and Twisted Tools. His personal work, under the EVAC moniker, has served as a primary focus for over a decade. With recent releases on Buried in Time & Cartesian Binary Recordings, as well as remixes for Funkstorung, Crunch, Rena Jones, & Logreybeam, EVAC continues to broaden scope. Unconfined by genre or process, EVAC represents an expansive palette of sound, capable of sonic landscapes that blur the lines between electronic and organic elements. Original music & additional productions have been released in association with: Colony Productions, Studio k7!, & Muti Music, MK12, PlayAirways, the RAI Arts Network (Italy), Ultra Music Festival, Universal Music Group, Vagrant Records, among others. At least 110mb of available disc space. Approx. 50mb of available RAM/per kit in use. Any software capable of using 24bit .WAV files. The package size for this download approx. 66MB zipped, so please allow yourself ample time to download the file if you are on a slow internet connection. On a fast connection, you should be able to download the package in about 3 minutes, while on a slower connection it may take up to 20 minutes. If you have any issues, please feel free to contact us 24/7 for help. Please consider using Firefox and the free download extension, Down Them All, if you are having problems with your downloads timing out. Get it at the Down Them All website. Made something using MK03 EVAC? Leave us something using our dropbox and vist ourcommunityarea where we display your work.